Hello all, if there is a thread on this that I missed please let me know! I don't want to be that guy. 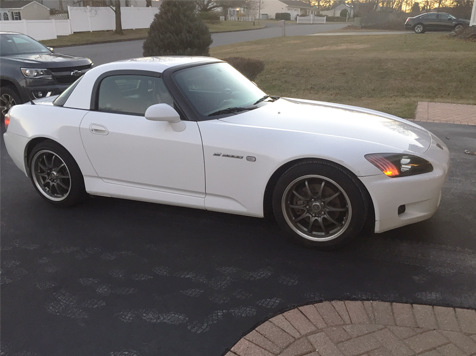 I recently picked up an S2k for the purpose of learning how to drive better, specifically getting time on the track and autocross. I have a small list of things I want to do to freshen it up/get it ready, already had the onceover done with Billman250. Here are some, maybe silly, questions that I know some folks here have worked around. Not planning on making this one in to a full race car, I think it's too clean for that (GPW/Black & Red/about 100k miles, 1 owner), I can find a neglected one if I'm going to do a full gut. Also want to still be able to drive the car on the street. Seats: I know changing the seats and adding a harness bar/rollbar will make driving hard at a track easier but is it worth it for where I'm at? I have no track experience as of today. Rollbar: From my research to date, I would go with the RSG bar if I did go this route if it's not deemed a terrible idea. I won't do a harness without a roll bar, read too much about how that's a terrible idea. Eventually, probably next winter after my first season, I'll add a splitter and wing (on another trunk to swap out for track days) and go from there. If the consensus is "dont do anything" I'm fine with that as well as "get another car and build a full racecar," I just know I'm not nearly up to that yet. None of that is needed to go out on track and/or autocross. Drive it as is for a year+ before buying seats and cutting it up for a rollbar. Aero isn't necessary in till you're more comfortable with the car. Revisit this thread in exactly 1 year. Thanks so much guys, I appreciate the input! Last edited by ThisIsRace; 01-23-2019 at 09:50 AM. Get a roll bar, seat, and harness. It will make you faster but most importantly keep you safer. Just remember, you can't buy that equipment as you are about to crash. Ideally you want a good halo seat. I had an AP1 that was a track/street car and I drove it to tracks from Watkins Glen down to Summit very comfortable in a Recaro Pole position. That seat was more comfortable then stock so find something that works for you and get it. Get the roll bar and get the harness. If you do it right, you will be more comfortable than stock. Change you brake lines to stainless and get quality pads on the car. Flush out all the fluids and get quality brake fluid in there as well. Make sure the oil is topped off every session and go beat the piss out of it. You will have a SAFE, comfortable, and reliable setup at this point for you to grow on. If you want to a bump up the performance a bit, throw some swift springs on there and just leave the car other then that. People will say you are fine in a stock seat setup starting out. I would highly advise against that, this is your life on the line. Things happen on the track all the time. Sometimes they are your fault, sometimes someone dropped oil, and other times there are mechanical failures. You want to put your self in the safest practical position for when these things occur. The initial investment will cost under 2k and most of the equipment will retain its resale value if you sell the car. ^Agree with everything, would only add that depending on where you are located a rollbar can be a requirement rather than optional. This is the case with a lot of east coast tracks and clubs. Unless Billman has given your brake lines a clean bill of health, I would replace any rubber brake lines with braided stainless steel since you probably have 100,000 miles on them. I would upgrade to a competition brake pad for track day use. I would sign up to run HPDE-1 with SCDA (SCDA-1.com) and/or NASA-NE (nasane.com), as both organizations will give you an instructor and provide classroom sessions between runs. At this point, spend your money on seat time until you learn how to drive. There are other HPDE options such as Track Night in America, but go where you can get the instruction for now. I would run with the hard top as opposed to top down. This eliminates the whole hassle of the broom stick test. Except for the above brake mods and a baffled oil pan, I still run a stock AP-2 after maybe 40 or more track days. You'll know when you want to install the roll bar, seats and harness or make other upgrades. You'll also know when and if those mods are necessary or unnecessary depending on how you drive. EDIT: And consider getting a Go-Pro or other dash cam and an Aim Solo or alternatively APEX-Pro. Use these as educational tools to analyze your driving, back at home after the event. Aim Solo data remains a big factor for my driving, but I've bought the Apex-Pro for new tracks since it provides somewhat instantaneous feedback. Hold off on the AP2 bumper and lip if you are trying to gain some kind of performance benefit. If you grow in the hobby and start doing time trials, it is not a permitted mod in NASA TT4/TT5 (the two main classes for the S2000). This is why you see all the fast TT4/TT5 do not have CR Lips. Also, to echo what someone else posted, definitely get a HANS as well. 100% going to mount up my gopro and definitely going to get going on changing the brake lines. Thanks a ton for those links, that's going to get me headed in the right direction. As of now I'm doing the S2k Takeover event upstate NY with an instructor, thanks for the input! Great bit of info, stupid question, does the HANS attach to the seat or helmet?